I created this mood board keeping in mind the spring theme. 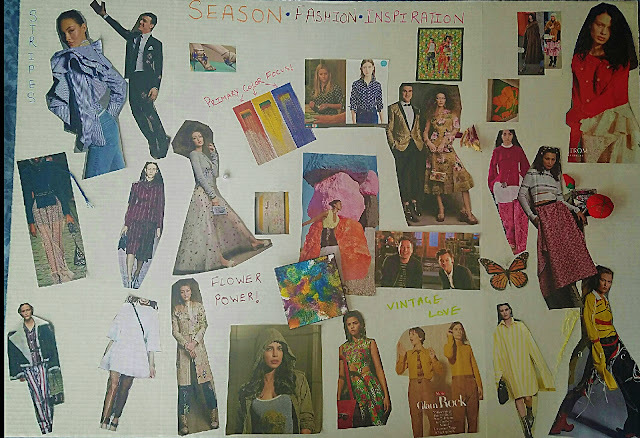 My source of inspiration has been varied ranging from Fashion runways to current TV shows, art exhibits, current fashion magazines and retail stores. The spring colors are in full form with the focus on primary colors - Red, Blue & Yellow. My pictures have the attention on these colors and their varied shades. So just to narrow down and sum up the current fashion trend of the season, I have put together this creation. In this, you will also see the pictures taken from the current fashion magazines have their focus on the florals and stripes which are evidently the popular picks of the season. Also, the clothing in the pictures have lot of attention to details on sleeves. Ruffles, layers are dominant part of the fashion styling this season. You will also see the hint of vintage. The striped pants for men and women in the pictures taken from the retail ads are vintage inspired and has the classic feel of 80s. The prints of florals and graphic designs in the pictures from fashion runways reflect the contemporary art. You will also see the pictures from the entertainment industry in the mood board where jimmy Fallon and Priyanka Chopra are spotting the stripes and earthy khaki looks of the season.Satin, staple cotton, wool, knits, silk and synthetic materials will be the ruling fabrics. Overall this mood board is mainly inspired by the spring season and its colors and vibes.